← Unforgettable family memories at the Magic Kingdom. I guess he would have enjoyed a pelican beak for this catch. What did he have for dessert? I wouldn’t bet on it! Herons are greedy beggars, you know. Big feast for the happy bird! He is certainly in for a challenge in gulping that down. Did you see him succeed or fail? No, after many efforts to maneuver it into his mouth, he seemed to abandon it in the mud. He was over the other side of the pond, so I couldn’t go over and check. I didn’t want to risk getting eaten by an alligator. Not whilst I was watching, he didn’t. I really think it was too big for him to handle. Ah, perhaps you’re right then. I often find it surprising how much some creatures are able to consume. I find myself watching natural history documentaries thinking “Oh, I think you were being a bit ambitious there mate” only for them to immediately swallow the whole thing! 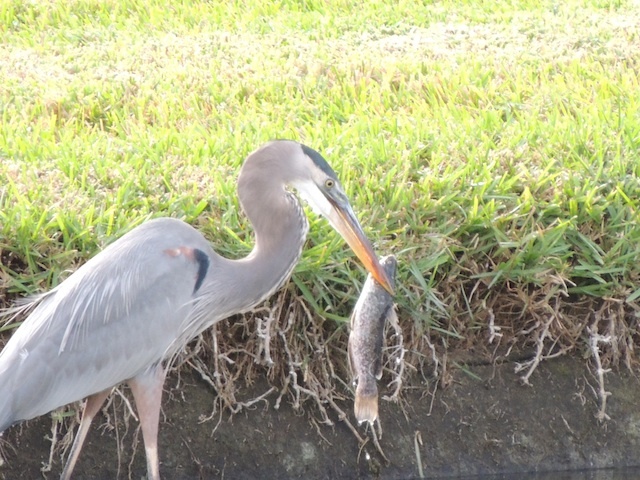 Nice catch .. for both you and the heron! I’m sure he will be able to figure out how get the lunch down. Right place at the right time …. and for you too. Looks like you’re giving Phil a run for his money! Great shot Sylvia. I’ll bet he was very pleased with himself. Tha is a pretty big fish, he’s rather ambitious! good morning – how are you? excellent post. he he ! offer still stands for luggage carrier, ! Like the backlight in his neck feathers. A stunning shot.